The Fed governors were out and about this week making speeches and back pedaling their December attempt to spit in the face of a collapsing stock market by raising interest rates. In other words, the Fed has blinked and there is no better evidence than the minutes from their December meeting that were released on Wednesday. Now, the “minutes” are NOT a transcript and are used to convey a narrative that the Fed uses to sooth market participants and talk down market volatility when they make a regrettable action. The Fed’s campaign message of patience was loud and clear this week as the Fed can’t maintain credibility if it turns the stock market into a singularity of wealth destruction. The Fed has imbedded itself into the circuitry of of the stock market for many years and I don’t envy the position of the Fed’s leadership. The incredibly difficult job of taking the punch bowl away while keeping the party going is an impossible task. For the mean time, they may have bought themselves some time and now we are on to earnings season which kicks off next week. There is potential for positive catalysts on the horizon with the government shutdown ending, trade talks with China resolving and with low expectations around earnings (easy hurdle to jump over). 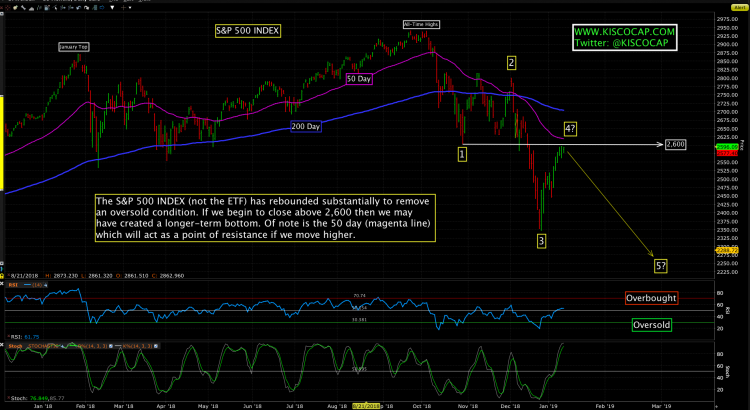 However, as the chart shows we are at a critical juncture where the market’s expectation of the Fed’s polarity will influence the next move. The next Fed meeting is January 30th, by the way. 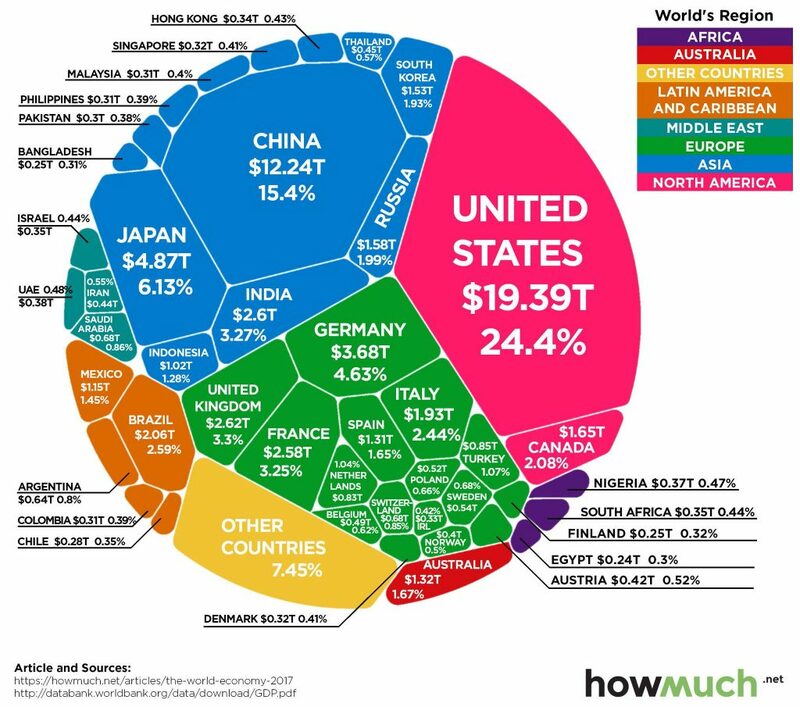 Below is a graphical representation of GDP by county. 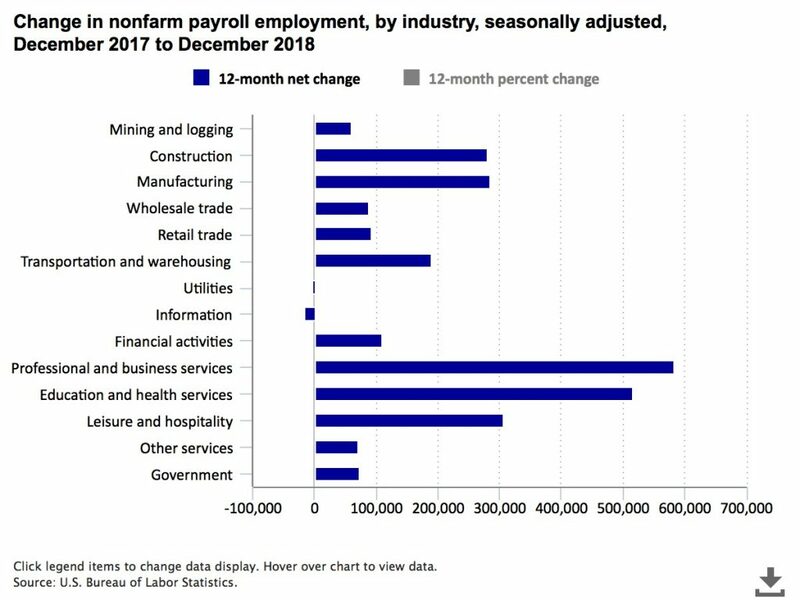 From December 2017 to December 2018, payroll employment rose by 2.6 million (1.8 percent), compared with a gain of 2.2 million for the previous 12 months. The December Eurozone economic confidence index fell to 107.3 from 109.5. That’s 1 pt below expectations and is at the weakest level since December 2016. 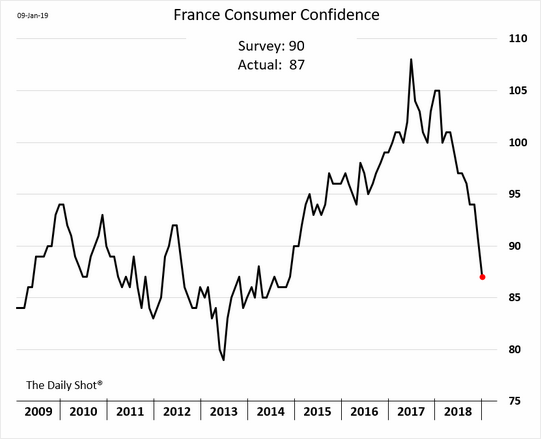 French consumer confidence has been tumbling for most of 2018. 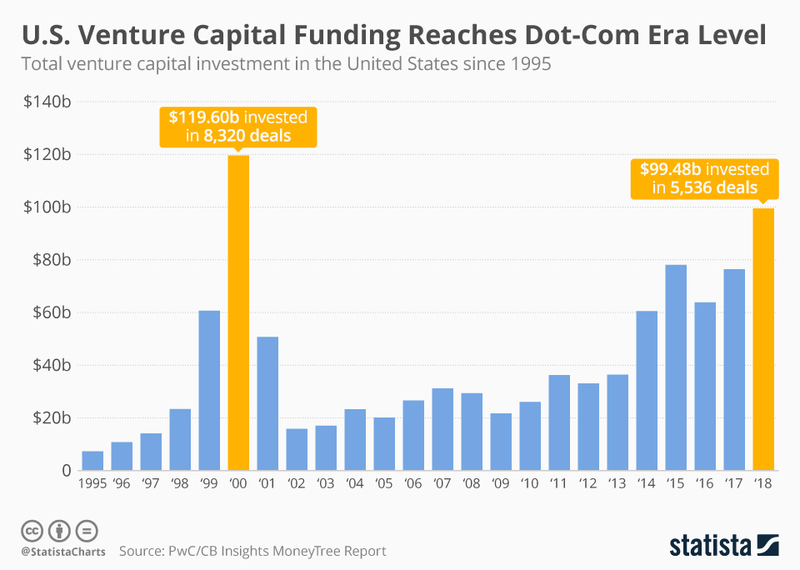 Venture capital activity in the United States reached its highest level since the dot-com era and Y2K. In the latest confirmation that global auto sales are sliding, Ford has announced a massive ‘restructuring’ of its European operations. The move follows in the footsteps of GM’s much broader restructuring, that will entail thousands of job cuts and possibly factory closures. 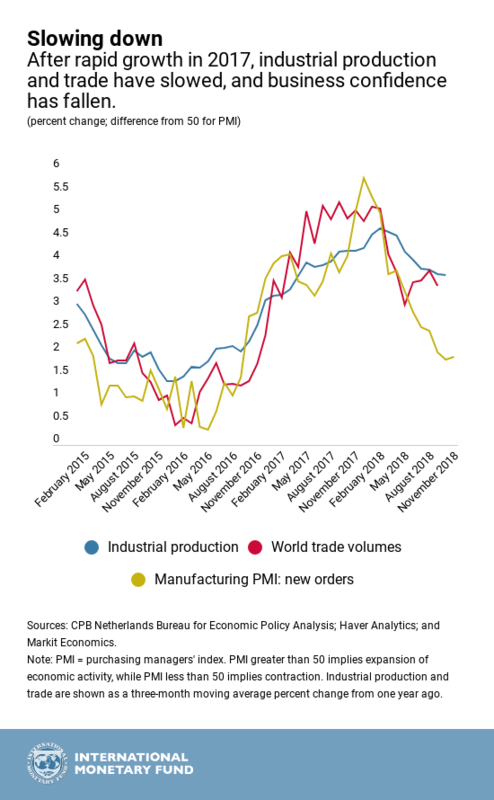 The cuts are hardly a surprise after the carmaker’s foreign profits have plunged over the past two years thanks in part to exchange rate-related losses spurred by the strength of the dollar, as well as poor sales of its diesel models. Moody’s Investors Service on Thursday became the second rating agency to push PG&E’s credit rating to junk status amid concerns over wildfire-related costs, sending shares of the California power utility sharply lower. Moody’s lowered its rating for PG&E to B2 from the investment grade level of Baa3, saying potential liabilities have grown and liquidity reserves have declined. PG&E subsidiary Pacific Gas & Electric also received a rating cut to Ba3 from Baa2. “The company is increasingly reliant on extraordinary intervention by legislators and regulators, which may not occur soon enough or be of sufficient magnitude to address these adverse developments,” Moody’s vice-president and senior credit officer Jeff Cassella said. What’s going on with the shuttered stores that were previously home to Sears, Kmart and other struggling retailers? Amazon-owned Whole Foods is eyeing the sites, sources told Yahoo Finance. While Whole Foods currently has more than 470 stores around the country, it is still a far cry from its competitors in the grocery space, including Walmart and Kroger.